Heatons has a heritage heading back to 1946, when it was founded in Athlone. Today it is one of the country’s largest groups of department stores with 54 across all parts of Ireland. Named as one of Ireland’s Best Managed Companies by Deloitte, it has earned a trusted reputation amongst industry and public alike. Here you’ll find everything you need to make your house feel like a home, as well as casual and athletic menswear sitting alongside perky and upbeat separates and dresses for ladies. You’ll be able to furnish your bedroom with sheets and covers you’ll love, bring home towels and mats for the bathroom, rugs and throws for the living room and cutlery and dinnerware for the kitchen. Every room of your house will be transformed into what you’ve always wanted for it. There are plenty of pet care products too so every member of the family gets to feel amazing. How do I use my Heatons Stores promotional code? Sign up to Heatons Stores’ mailing list to hear about some brilliant offers! Do Heatons Stores have a clearance section? Yes, it’s here and a great place to grab yourself a bargain. Where is my nearest Heatons Stores store? You can search for your nearest Heatons Stores here. Can Heatons help me find the right size? Absolutely, its size guide is right here. You can return your Heatons Stores purchase within 14 days of receipt to receive an exchange or refund. Item must be in original conditions and packaging. Instore purchases can be returned to a store, online purchases must be returned to: Customer Returns, Unit B, Brook Park East, Shirebrook, NG20 8RY. Print the returns form, complete it and return it with your invoice and goods to the above address. Full policy here. Redecorating your house? Moving into a new home or just fancy a bit of a change? 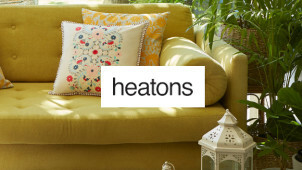 You want to head to Heatons, a store dedicated to making your home the best it can be, with contemporary homewares and home textiles available for all. Shop with a Heatons promo code from vouchercloud and you’re sure to come up with something amazing for your bedroom, bathroom and beyond. Usher in the new season style with the Heatons collection today. There are 54 Heatons stores across Ireland, so wherever in the country you happen to be, it’s very likely there’ll be one near you. From the east coast towns of Wexford and Drogheda to Ballina and Castlebar in the west, you’ll not be far from one of the country’s favourite furnishing stores. The big cities are covered too with Cork, Limerick, Dublin and beyond hosting multiple Heatons outlets. Seek out your nearest Heatons today! Your bedroom is your sanctuary from the world, the one place you can count on to keep you cosy in the face of whatever life throws at you, so take care of it with duvets, pillowcases, sheets and more from the best at Heatons. Shop with a Heatons discount code from vouchercloud and you’ll be sure to come in with a welcome saving, so you can sleep easy knowing you’ve made your bedroom your own for less.